A wide range of procedures, including natural coloured fillings, onlays/inlays and root canal treatments, designed to restore your teeth to a functional and aesthetically pleasing level. Regular examinations, cleaning and radiographs help keep your teeth and gums healthy. They also help identify small issues you may be experiencing, allowing us to correct them before they become problems. Alita Dental offers you two choices in whitening: in-chair or at-home. We also offer veneers to close gaps, straighten crooked teeth, repair chips and cover stains. 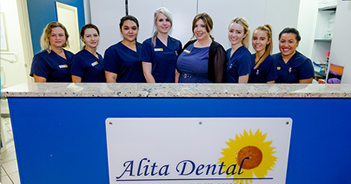 Our dental team is confident providing fixed as well as removable appliances catered to your individual needs. We have provided orthodontic solutions for patients as young as six and as old as 84. Our dental orthodontic consults and imagery are no obligation and free of charge. We provide comprehensive treatment of both gingivitis and periodontitis to manage gum disease. We offer a wide range of oral surgical procedures, including wisdom tooth extraction, impacted tooth extraction, frenectomies and minor oral surgery to remove cysts, painful papillae and associated hard and soft tissue. We offer three types of crowns, bridges designed to look and feel like your natural teeth and dental implants that are a high technology permanent solution to replace one or more missing teeth. We supply patients with several types of dentures, including full and partial dentures in acrylic or cobalt chrome. We offer digital state-of-the-art low radiation dosage x-rays to ensure a comprehensive dental exam.